Prior to 1967, access rights to State Forests were tolerated within the context of customary rights. However, during the New Order regime (1967-1998), the Indonesian government passed numerous legislation — such as the Basic Forestry Act of 1967, the Basic Mining Act of 1967, and the Basic Agrarian Law of 1969 that placed the rights of the State and national development ahead of the rights of individual communities. For example, the Basic Forestry Act of 1967, although recognizing the existence of locally owned forests, stated that local communities could not obstruct the implementation of government development agendas. In the 1980s, the national government classified over 75 per cent of the nation's land as State Forest, essentially taking land away from local communities and putting it under state control and administration. The approach ignored pre-existing local rights to millions of hectares of land, forests, coastlines and other natural resources. The state claimed authority as the only legitimate owner of all resources in these areas and has used this authority to prioritize economic development, usually at the expense and interests of local communities. This assertion of state authority, especially during President Suharto’s thirty-two-year campaign for economic development, contributed to the rapid depletion of Indonesia’s natural resources, usually to the detriment of resource dependent communities. Since the onset of the Indonesian economic crisis in 1997, illegal logging has increased across the country. Even prior to the implementation of formal regional autonomy (decentralization) in 2001, the power vacuum left after the end of Suharto’s New Order regime resulted in de facto regional autonomy, where the district heads gained now-found power to grant small logging concessions which legalized illegal logging and export activities. It is defined as illegal logging because the central Indonesian government and international organisations regard much current timber harvesting as illegal, whereas local communities see the timber coming from their own traditionally managed forests as part of negotiated agreements with loggers. Indonesian land tenure divides land into areas classified as State Forest and those classified as non-state forest. The areas classified as state forests are controlled by the Ministry of Forestry, while the National Land Agency has authority to grant rights over lands classified as non-state forests. It is worthwhile to note that forest land makes up the majority of the land area in Kalimantan. The Ministry of Forestry’s claim to land does not allow the local government to title land parcels to forest communities. That is one of the main administrative barriers against land certainty in Kalimantan. In addition to the Land Agency and the Ministry of Forestry, several other central government agencies have some power to claim land, such as agencies handling mining and infrastructure. Rural lands in Kalimantan are claimed mostly by indigenous, state and private actors. Since the provincial spatial zoning plan has not been finalized, numerous claims are currently overlapping and contradicting each other. At the same time the claims from indigenous peoples cannot be addressed by local regulations alone. Due to this problem, national laws, regulations and policies aiming to resolve land tenure issues cannot be implemented properly. Furthermore, the lack of institutional support prevents the efforts to formally recognize customary rights on land..
As in many places in Indonesia, the complexity of contested claims on lands among different actors shapes land tenure in Kalimantan. Four categories of land claims, based on the actors involved, include private or individual, communal, open access and state claims. These categories, however, are not clearly established with agreed-upon and well-defined boundaries. In 2012, the state recognized customary rights on land pursuant to the Constitutional Court Decision. However, the recognition of customary claims on forest is not straightforward in practice due to the complex structure of adat land tenure and red tapes within the government. The rich forest and mineral resources of Kalimantan have brought considerable wealth to both the Indonesian government and a host of businesses with differing degrees of legitimacy, but not to the majority of the indigenous inhabitants. Traditional economies and resource management systems have often been disrupted and customary land tenure ignored. How do scholars and professionals outside of forestry conceptualize the practice of illegal logging in Indonesia? What are other possible ways of framing this problem? What special expertise, resources, or theoretical orientations might others bring to help us understand this phenomenon better? Illegal logging causes serious environmental problems such as deforestation leading to reductions in carbon stocks, degradation of biodiversity, lowering water quality and has implications for climate change. 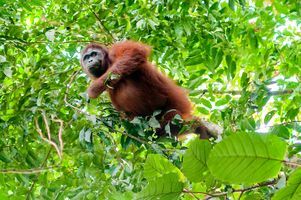 An example is the habitat loss of critically endangered Bornean Orang-utan from the constant threat of illegal logging in the forests of Indonesia  Wildfires as a result of illegal logging reduced forest coverage and caused streams that supplied drinking water to run dry. High economic value tree species are at risk of extinction due to highly selective logging. This damage to the residual tree stand alters the path of stand development such that more non-commercial trees will achieve canopy dominance. This in turn reduces the economic value of these forests and increases the likelihood of land use conversion as it may be viewed as degraded forest by the government. Many communities in Indonesia affected by forest concessions have state-issued certificates recognizing their communal rights to forest lands. In addition, some of these communities qualify as indigenous people with rights to land and natural resources being well supported by international law, including by the International Convention on the Elimination of All Forms of Racial Discrimination (UN-CERD), to which Indonesia is a party, and the UN Declaration on the Rights of Indigenous Peoples (UNDRIP). Indonesia’s enforcement of affected communities’ usufruct rights and its recognition of indigenous rights, however, are weak both in law and in practice. Although the Indonesian Constitution recognizes the customary rights of traditional communities, including land rights, sectoral laws such as the 1999 Revised Forestry Law and the 2004 Plantations Law provide little protection. For example, Indigenous community must be able to demonstrate that their rights exists before a local regulation can be passed to allow due process for consultation and compensation by plantation companies. In response to raising conflicts due to unclear land rights, the People’s Consultative Assembly, Indonesia’s upper house of parliament, passed an Act in 2001 directing the House of Representatives, the lower house of parliament, to review natural resource laws in order to strengthen community rights and thereby address conflicts. More than a decade later, this review has yet to take place. Likewise, a draft law on indigenous rights has been stuck in the House’s legislative committee for several years. Illegal logging can result in the loss of government revenue, consequently undermining the competitiveness of the legitimate forestry industry. Such losses can be significant; it has been estimated that the Indonesian government lost US$9 billion between 2003 and 2014 due to illegal logging and forest sector mismanagement. Loss of revenue undermines efforts to place the forest sector on a more sustainable footing, as lost revenue cannot be reinvested in the sector. Illegal logging also distorts global markets and undermines incentives for sustainable forest management, as illegal timber is often cheaper than legal timber. 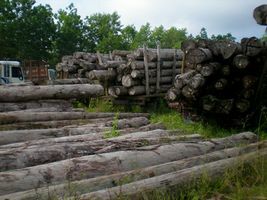 Communities often agree to such operations on their customary lands as they can beneﬁt from them in three ways: ﬁrst, because they are paid a small fee for each cubic metre of timber extracted; second, because they can gain employment in illegal logging camps; and third, because additional jobs are also created in the unlicensed mills that process the timbers. Jobs in the mills and camps provide short-term support to the socio-economy of rural communities, as the operators provided much flexibility for labourers who work seasonally, when they can afford to be away from farms and homes. Illegal logging destroys the lives of local communities and native populations. When the forest goes, so does their traditional way of life. Unable to live by foraging and trading, they begin to rely on the logging companies for food and an income, and become caught up in what can only be described as modern day slavery. Ancient tribal cultures are lost in the space of one generation, as remote communities become a shadow of what they once were  The national government also passed legislation aimed at eroding the traditional heritage of local communities. The 1979 Law on Village Administration standardized village governance across the archipelago and replaced local systems of community governance with a Javanese model. Local customary leaders were marginalized or removed and were replaced with State's henchmen; the latter had little interest in maintaining traditions that did not benefit them, and in some cases even called into question their legitimacy. Although many ethnic minorities are faring better under decentralization (after 1998), some groups that became minorities due to redistricting, or that remain minorities within an existing district, are in some cases doing worse. In places such as Kalimantan, many politically powerful Dayak groups have been doing well since decentralization. They have been able to regain control of land and resources that they had lost under previous governments. However, this is not the case for every ethnic group. For example, the Punan, a group of forest-dwelling foragers in Kalimantan, did not fare as well as other Dayak groups. They are still a minority group and are often unable to organize or gain any political power. As new rights and monies are being distributed, the Punan are often forgotten or in some cases outright ignored. How could someone from a different discipline or profession add to the implications above? What other implications become apparent when illegal logging is viewed through the lens of other disciplines and professions? What special expertise, resources, or theoretical orientations might others bring to help us better understand the implications associated with illegal logging in Indonesia? Provincial government should seriously draw up and implement rules and regulations to execute the Constitutional Court Decision. The legal basis to implement the Constitutional Court Decision could refer to the current international agreements ratified by the national government, for example UNDRIP and FAO's Voluntary Guidelines on the Responsible Governance of Tenure. An anti-corruption commission directly reporting to the President should investigate all corruption allegations within the government. That would send out a clear and strong deterrent signal by meting out heavy punishment for government officials involved in mal-administration, and any form of corruption or fraud. CITES (the Convention on International Trade in Endangered Species of Wild Fauna and Flora) as a tool to combat illegal logging. Getting threatened or endangered species listed on one of the three Appendices of CITES, leading to limiting or banning the trade of endangered native timber species. Indigenous communities in Indonesia live in a world of uncertain laws with the knowledge that existing laws have always been manipulated by self serving, corrupt, powerful individuals who lack integrity. Laws which protect the rights of indigenous peoples have little meaning if they are widely ignored and not enforced. Ironically, the forest law is instead commonly used against indigenous people and rural poor with hundreds of people detained in Indonesian jails for having claimed their rights on their land, forests and other resources while resisting eviction and land grabs The positive feedback loop of poor governance leads to rampant widespread illegal logging and deforestation of Indonesia forests. Conversion of natural forest into agricultural and oil palm plantations has also contributed to the rapid loss of forests in Indonesia. Perhaps only a reset of the political system or strong political will from the president to thoroughly flush out corruption can promote good governance and the integrity of government officials to serve the citizens of Indonesia. ↑ 3.03.13.2 Worldbank, (2015). Central Kalimantan Land Governance Assessment. ↑ Curry, D., & Ruwindrijarto, A. (2000). Illegal logging in Tanjung Puting National Park, an update to the final cut report. Jakarta, Indonesia: Environmental Investigation Agency and Telapak Indonesia. ↑ Illegal Logging Portal. (n.d.). Major impacts. Retrieved from http://www.illegal-logging.info/topics/major-impacts. ↑ Greentumble. (2016). The negative effects of illegal logging. Retrieved from http://greentumble.com/the-negative-effects-of-illegal-logging.